Click the "+" icon to show a card. Ferdinand Lindheimer arrived in Texas as it was becoming a republic. Later, he played important roles in the developing New Braunfels community. 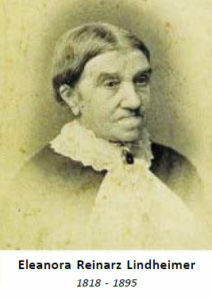 Lindheimer created the town’s first botanical garden, served as superintendent of the county school, and first justice of the peace. 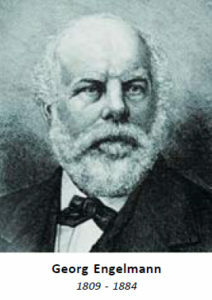 He was also editor and publisher of the Neu-Braunfelser Zeitung. 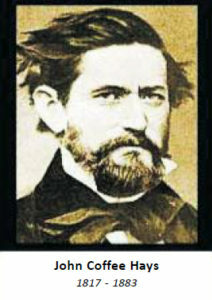 During the Civil War, Lindheimer was the leading voice on politics and economics among German Texans. Today, Ferdinand Lindheimer is remembered as the Father of Texas Botany. 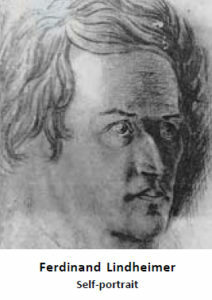 The 33-year-old Ferdinand Lindheimer followed his former teacher Georg Bunsen to America in 1834. Lindheimer soon joined other German adventurers at Engelmann’s Illinois farm about 20 miles from St. Louis. A warmer climate, however, called Lindheimer as the fall season brought colder temperatures. Lindheimer and five companions took a riverboat to New Orleans where the restless Germans had difficulty deciding their next move. Texas beckoned some with offers of affordable land. Others heard a different call and looked beyond the Gulf of Mexico to land with mineral and plant riches described by the scientist and explorer Alexander von Humboldt. 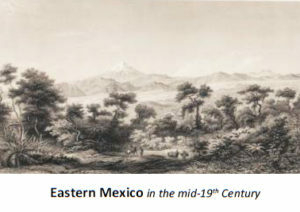 Thus began Lindheimer’s and the Friedrich brothers’ journey to Mexico. Neu-Braunfelser Zeitung was one of the earliest German-language newspapers in Texas. 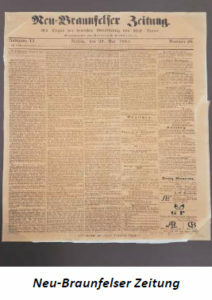 This forerunner of today’s New Braunfels Herald-Zeitung began weekly bilingual publication in 1852 with Ferdinand Lindheimer as editor & publisher. Through his newspaper, Lindheimer had a great impact on people in the community, teaching them democracy & how to think for themselves. His editorial voice was critical during the Civil War as he used his paper to challenge the new citizens about freedom and what it really meant. Were these German immigrants to support slavery, a practice in their new country but not in their native land? Were they to simply “blend-in”? These challenging questions proved so unpopular that locals threw his printing press into the Comal River. Lindheimer retrieved the press and continued work. 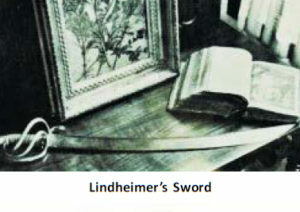 The sword in the Lindheimer family home was presented to him by Prince Carl, who described Ferdinand Lindheimer in a letter to the Adelsverein. “Among the Germans lives a botanist. His name is Ferdinand Lindheimer. Appears to be a scholar who is wrapped up in his work. He can be of use to us informing us about the flora on our grant”. The “us” referred to The Society for the Protection of German Immigrants in Texas, known commonly as the Adelsverein. This group was formed in 1842 by German princes to direct German colonization in the Republic of Texas. 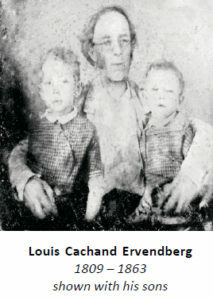 In late 1844, Prince Carl hired Lindheimer and Ervendberg to bring the first group of immigrants from the Texas coast to New Braunfels. Lindheimer built his saltbox-styled Fachwerk house in 1852 on land given to him by the Adelsverein. Fachwerk, half-timbered and half-masonry construction, had been used for centuries in Europe and was especially popular in Texas German communities. In the Lindheimers’ house, the roof at the back slopes lower than the front roof. Stucco covers Fachwerk on three sides and brick defines the back of the house. 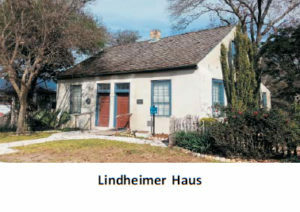 Lindheimer Haus is located at 489 Comal Avenue and serves as a small historical museum today. In 1968 the property was donated by Lindheimer’s family to New Braunfels Conservation Society and was placed on the National Register of Historic Places. 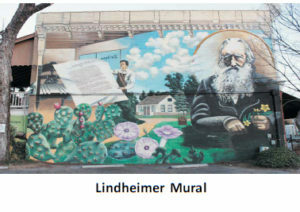 Located at 165 S. Seguin Avenue, the Lindheimer Mural was painted by San Antonio artist Alex Brochon and features Ferdinand Lindheimer, Father of Texas Botany. The mural was dedicated May 21, 2001, in celebration of Lindheimer’s 200th birthday and to honor his botanical achievements. The mural also depicts representations of Lindheimer’s varied lifestyle and accomplishments. What flower do you think that is in his hands? 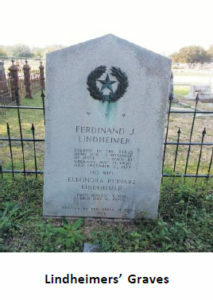 The graves of Ferdinand and Eleonora Lindheimer can be found in Comal Cemetery between the outer fence running along Peace Street and Avenue B. New Braunfels Public Library is nearby. As part of the 1936 Texas Centennial celebration, the state placed a graveside marker. It reads: “A soldier in the Texas Army 1836, a botanist of note. Erected by the State of Texas 1936” The Lindheimer graves are tended by the New Braunfels Garden Club. A member of the Onagraceae or evening primrose family, the genus Gaura is composed of rather weedy plants. 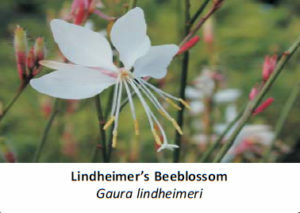 The Gaura lindheimeriperennial ranges from 2–5 feet in height and has four-petaled flowers. Conspicuously long stamens also distinguish this species. Butterflies love the plant. Asa Gray cultivated Lindheimer’s gaura and then exhibited it at the Horticultural Society in Boston. Ipomoea lindheimeri, also called Lindheimer’s morning glory, is a member of the Convolvulaceae family. Ipomoea is the largest genus in the flowering plant family and has some 500 species. 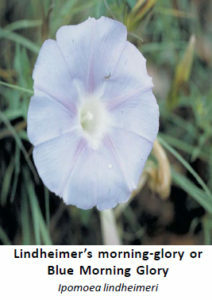 The pale-blue to lavender colored flower of Lindheimer’s morning glory opens each morning and closes by noon. The hardy vine likes full sun and blooms April through October. It attracts bees, butterflies, and hummingbirds, making it an important resource for pollinators. The botanical name for the grass family is Poaceae, which includes Lindheimer’s muhly. Also referred to as big muhly, Muhlenbergia lindheimeri is a large-scale grass, with blue-green leaves and silvery seedheads. 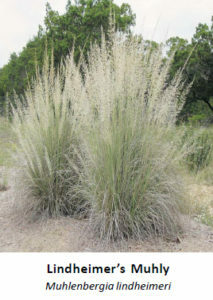 This perennial bunchgrass has fine foliage and a fountain-like form. 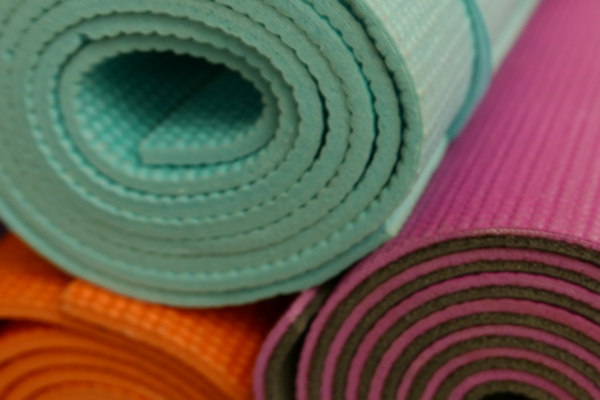 Its 2–5-foot height makes it useful as a landscape screen. Birds eat its seed. Parts of big muhly are used for nesting and denning materials. Big muhly’s extensive root system helps soil stabilization. 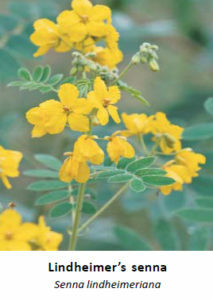 A member of the Fabaceae or pea family, Lindheimer’s senna is a bushy perennial ranging in height from 1½-3 feet and arising from a woody root. The five yellow, oval petals have a distinctive crimp at the edges. 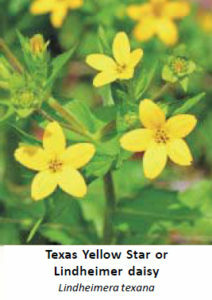 Its yellow blooms are often seen in Comal County during the months of September and October. Some of your grandparents may remember this plant because of its dried seed pods, the sound of which reminded them of a rattlesnake. The seeds are also an important source of food for birds. The predominant cactus in the southern part of our state is Texas prickly pear. Its pads (nopales) are up to 1 foot long and are profusely covered with 2-inch spines. The yellow flowers are sometimes marked with orange or red at the base of the petals. This Opuntia has a fascinating host-guest relationship with cochineal scale insects, a source of red dye. Cochineal dye became a valuable export among Spaniards in the New World and was second in importance only to gold. 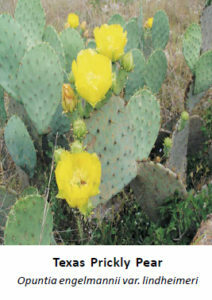 Texas prickly pear is found abundantly throughout Comal County. Typically 3-6 feet in length, this great climber can reach bird nests without difficulty. Texas rat snake’s diet includes rodents, eggs, and birds. 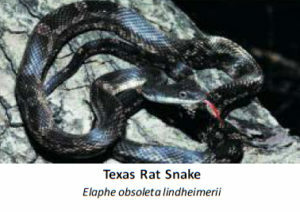 Texas rat snake can be found in brushy wooded areas, grasslands, swamps, and barns. Their fondness for hen’s eggs has gained them the name “chicken snake.” Although the Texas rat snake is non-venomous, it will bite when threatened. The snake forms a menacing “S” strike position. A member of the aster family (Asteraceae), the Lindheimer daisy is 6-24 inches tall and has a lovely yellow flower head. Each 1–1 ¼-inch petal contains two veins and is indented at the tip. Enquist describes “the yellow flower heads as having 5 ray flowers and 2 or 3 times as many disk flowers”. Goyne tells us that Lindheimer was preoccupied with this annual plant which he called “little asteroid.” But Lindheimer had a secret. He dreamed the “little asteroid” would make him immortal in the annals of botany. What do you think? Ferdinand Lindheimer made an important observation when he noticed the lack of bees throughout Central Texas. Peach, plum, and other fruit trees blossomed abundantly but produced poor quality fruit. Without bees to transfer the pollen, there could be no edible fruit. 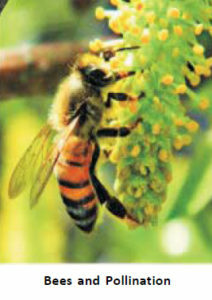 Lindheimer then persuaded Wilhelm Bruckisch to bring Italian black bees to Texas for pollination of fruit trees in the Guadalupe River valley. 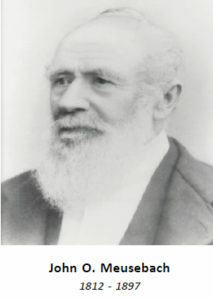 Wilhelm Bruckisch founded the Silesian Beekeepers’ Society in 1845 and worked closely with Pastor Dzierzon, considered the bee master of Europe. Answering Lindheimer’s plea, Bruckisch arrived in New Braunfels in 1853 with Italian black bees. The bees performed the job of pollination so well that early settlers were soon able to harvest larger and more abundant crops. Bruckisch published six editions of Bienenbuch (Bee Book). 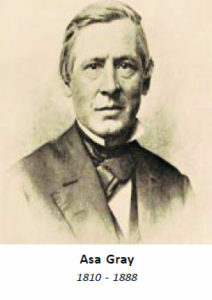 His work “Bee Culture” was reported in “Annual Report for 1860 (Agriculture)” of the U.S. Commissioner on Patents. Bruckisch was the first person in Texas to become interested in commercial possibilities of bees and introduced the box hive with removable frames. 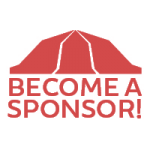 Georg Engelmann immigrated to the United States in 1832 from Germany and ultimately settled in the St. Louis, Missouri, area. He was educated as a medical doctor and as a botanist. Lindheimer once told him: “I cannot think of anything I prefer to wandering around and gathering plants and preserving them.” Later, it would be Engelmann’s correspondence with Lindheimer that served as Lindheimer’s connection to civilization and botanical circles around the world. Engelmann was also scientific advisor to Henry Shaw on the development of what became the Missouri Botanical Garden. Prince Carl’s sixth report to the Adelsverein described the effect of Rev. Ervendberg’s December 23, 1844, Protestant service for the newly arrived immigrants. “It induced a very earnest and tender feeling in the congregation, & many shed tears of heartfelt emotion.” Delayed by rains, Lindheimer and Ervendberg got these first settlers to New Braunfels on March 21, Good Friday, 1845. Ervendberg became first minister of the German Protestant Church, today’s First Protestant Church. He and his wife established Neu Wied or the Orphans Home near present day Gruene where they cared for 19 orphaned children. 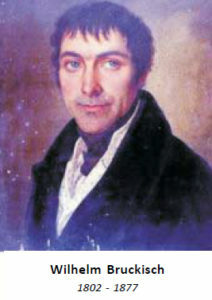 Ervendberg was also an accomplished naturalist and botanist. At Neu Wied, he grew silkworms and experimented with exotic wheats. Ervendberg’s tobacco plants made excellent cigars. In 1842, Harvard College offered Gray a job teaching botany and overseeing the botanic garden. This gave him the opportunity to collect specimens from others. In 1843, Professor Gray commissioned Lindheimer to make a collection of largely unknown Texas plants and wildlife. In a land terrorized by bandits and Indians, Lindheimer began a 10-year period of collecting plants, which were shipped to Dr. Gray. 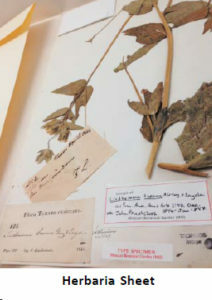 Today, many of those plants are at Harvard University’s Gray Herbarium. Ultimately, Gray was considered one of the most important botanists in North America. 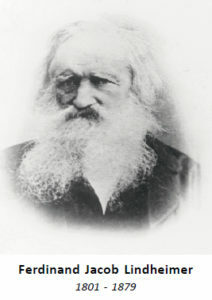 “Jack” Hays was born in Virginia in 1817. He lived in Texas for 13 years and became Texas Ranger extraordinary. Hays mixed a military career with surveying and grew very adept at protecting surveying parties against Indian attacks. 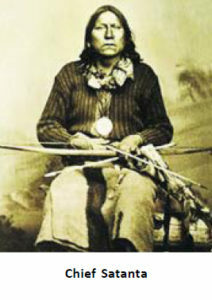 Hays is credited with effective use of revolvers and revolutionizing warfare against Texas Indians. Hays also played an important role in Meusebach’s efforts to open the Fisher-Miller Grant to new settlers through his presence at the signing of the Meusebach-Comanche Treaty. Baron Otfried Hans von Meusebach upon immigrating to the United States took the simpler name, John O. Meusebach. An accomplished botanist, he explored areas in Central Texas with Ferdinand Lindheimer. 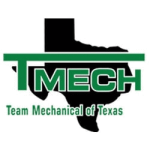 Meusebach was also greatly interested in the geology and mineralogy of Texas. Meusebach succeeded Prince Carl as Commissioner-General of the Adelsverein. One of his greatest accomplishments was the 1847 Treaty with Comanche Indians permitting safe passage of German settlers to lands beyond Fredericksburg. Ferdinand Lindheimer was part of these negotiations. The lands passed through Indian territories. Meusebach was highly regarded by the Indians who called him El Sol. His red hair reminded them of the sun. Veracruz, on the eastern coast of Mexico, was a gateway for both adventurers and goods flowing into and out of the country’s interior. A German settlement called El Mirador was established in the fertile highlands above the old port town. Botanical specimens collected at El Mirador were sent to leading European museums. Reports of new and undiscovered plant specimens proved irresistible to Lindheimer. His friends, the Friedrich brothers, had accompanied him to Veracruz and bought land for a coffee plantation and gristmill. Lindheimer first collected plants and lived off the land but later took employment managing a distillery. He remained at El Mirador for 1½ years and later described it as “one of the most beautiful areas of the earth.” Restlessness again overtook him as he realized El Mirador would never bring him fortune. Texas independence might. New Braunfels was originally planned as a way station to the Adelsverein’s primary property of the Fisher-Miller Land Grant north of Fredericksburg. As difficulties mounted, many immigrants decided to make New Braunfels their home. 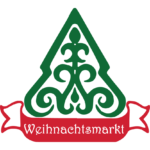 Town lots had been platted by Nicolaus Zink, the Adelsverein’s engineer. Each head of a family was to receive a half-acre town lot and a 10-acre farm. 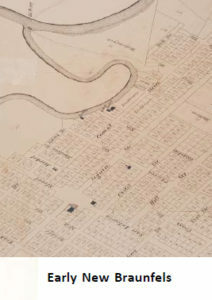 The town was laid out with the main street (Seguin Street) running parallel to the Comal River. This arrangement allowed easy access to water. Located on especially arable land on the higher side of the Comal River, Lindheimer’s botanical garden was in a particularly desirable spot. 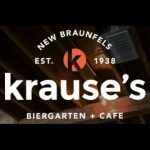 In 1845, Prince Carl founded New Braunfels and named the city for his German home of Solms-Braunfels. 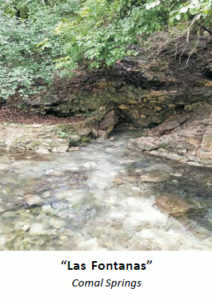 The site was chosen because of the nearby Las Fontanas(Comal Springs). Comal Springs are the largest group of natural springs in the American Southwest and are the headwaters of the 3-mile-long Comal River, said to be the shortest river in the United States. Comal Springs are also the largest artesian springs west of the Mississippi River. Unique underground formations of these springs are an important part of the Edwards Aquifer. 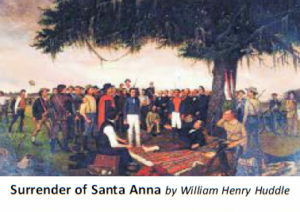 Artist William Henry Huddle painted Surrender of Santa Anna the morning of April 22, 1836, the day after the Battle of San Jacinto. Mexican General Antonio López de Santa Anna, in the uniform of a private soldier, was brought before Texas General Sam Houston as a prisoner of war. Houston, wounded in the battle, rested on a pallet under the oak tree while arranging an armistice with Santa Anna. To the right, seated on a log, was Erastus “Deaf” Smith, famous Texas scout; the captured Mexican battle flags were leaning nearby against the tree. To the left and rear of Houston was his Secretary of War, Thomas Jefferson Rusk, who was standing next to Colonel Mirabeau B. Lamar. More than 30 other historical figures were depicted in this painting. It has been on display in the first floor south wing of the Texas Capitol since February 1891.